Sometimes I get a lot of mileage out of just one intersection. I walked back and forth across the crosswalk through several light changes, snapping pictures. This is the latest of several I’ve done from the same intersection. 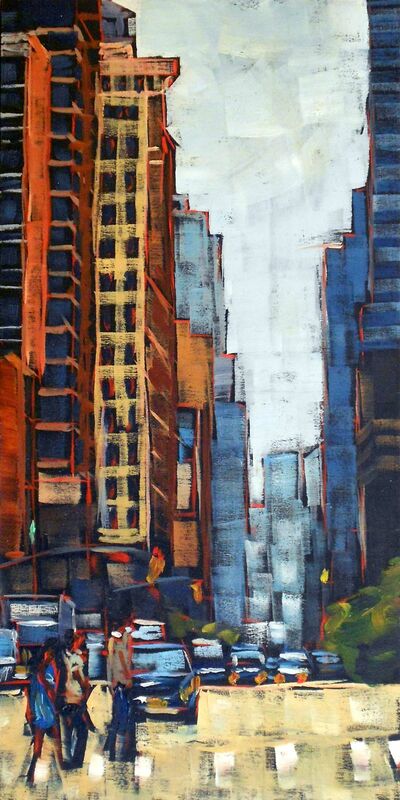 I’m in love with this 6 x 12 size–it totally lends itself to paintings of the city. 6 x 12 inch oil on 1.5 inch thick cradled wood panel. Click here to bid, go here to see other paintings, and go here to see my Daily Paintworks gallery.